Kolby Smith is one of those players who is faster in pads than he looks. He finished his college career at Louisville with 1698 yards on 288 carries as primarily a part time starter. 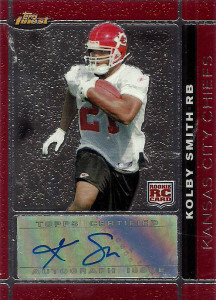 Running a 4.5 at the combine, Kolby was taken in the 5th round of the 2007 NFL draft by the Kansas City Chiefs, who were looking for new blood behind Priest Holmes and Larry Johnson. He’d get into the lineup sooner than anyone expected after the sudden retirement of Holmes and injuries to Johnson. Listed as a fullback, he’d finish 2007 with 112 caries for 407 yards and 2 TDs . Smith contributed in 2008 with 100 yards on 35 carries, and 10 receptions for 52 yards. An ankle injury claimed the end of Kolby’s 2009 season and he’d be waived in 2010. Both the Broncos and Jaguars took speculative looks at him, claiming Smith off of waivers, however he’d not see the regular team roster for either squad. Kolby has already decided to leap into coaching, where he worked at Arkansas in 2012 as a General Assistant, and 2013 at Western Kentucky University as the runningbacks coach.